In addition to carrying their three symbols, Irish rings also give out certain messages about the wearer's romantic condition. These are popularly known, so be sure you are giving the right signal! If you are courting, but not yet at a committed stage of a relationship, you should wear your ring on your right hand with the heart pointing towards your nail. This suggests that your heart is still looking outward for love. Claddagh engagement rings are also worn on the right hand, but at this stage the ring should be turned around so that the heart points inwards, towards your wrist (and, in symbolism, towards your own heart). 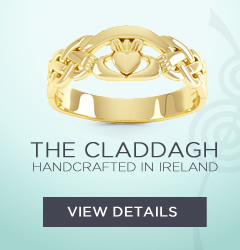 On marriage, an Irish ring is worn on the left hand with the heart pointing inwards. This gives the message that you are in a happy marriage, and enjoying the friendship, love and loyalty of your spouse.